Trees used for street plantings require a number of characteristics, and although the situation does vary some of the basic requirements for street trees remain the same in many circumstances. Wholesale growers can provide good horticultural information on the suitability of trees for street in different climates, soils and maintenance requirements. A quick analysis of the common needs of street trees leads us to the following qualities. Height – Street trees need to be of a size that will not interfere with power-lines or can be pruned to such a height easily and economically. Root System – The factors of root systems and drainage lines as well as root systems that are close to the surface and may lift pavements need to be considered. Litter – All trees drop litter, and deciduous trees will drop leaves in winter. However trees that continually drop leaves, bark, seed pods and fruit can present a problem in street plantings. Limb Sheer – Trees that easily drop limbs due to wind, stress or other factors may not be suitable for some street plantings. Street trees are an integral part of the urban environment, providing shade, helping with air quality as well as being used for their aesthetic value. 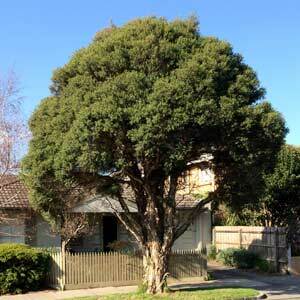 Choosing the right trees for street plantings can help with all of these as well as improve property values. Considerations including watering, root barriers and eventual height and width all need to be taken into account. One of the best street trees in many respects is the English Oak, and although it is falling out of favour it still meets many of the requirements and needs to be considered.